I’ll be honest – we’ve been putting off writing this post. Speech sounds are something we work with all day every day and we are constantly making judgements about whether a child’s speech clarity is within the average range or not. However, it’s difficult to summarize it in a post like this. I know it’s information that lots of people are looking for online though, so we’re going to give it a go! There are various different sets of guidelines that are used quite frequently. I will get to some of these in more detail in a minute, but first of all, a few words about age norms. Just like all age norms for children’s development, there will always be variability. Some babies walk at 10-11 months, others not until 18 months or later. Similarly, some children will speak really clearly right from their first words, and others take much longer for their speech to become intelligible outside the family. Also, although they are similar, the different sets of age norms that we work to are not all exactly the same. That’s because they were researched in different ways and at different times. There will also be some variation of what’s normal between different countries – certainly if English is not your child’s first language, there is likely to be variability in what sounds they use when. How intelligible is your child’s speech? Some children have a huge range of sounds that they struggle with but they are understood well by most people. Other children may have a problem with fewer sounds, but it really affects their ability to be understood by those around them. What sounds are they using instead? It is not enough just to know which sounds a child is having difficulty with. A speech and language therapist will also want to investigate which sounds they are using instead. How consistent are their productions? Do they say the same word in the same way every time? Is it clearer when they are copying than when they are speaking freely? Or the other way around? As you can see – it is not as easy as looking at a chart. 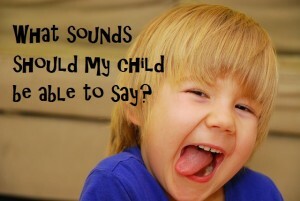 Now let’s return to the question of which sounds your child is using instead of their tricky sounds. Some sound substitutions are very common in young children. These patterns are known by therapists as “normal phonological processes”. For example, many children say “t” in place of “c/k” to begin with. Hearing a child say “tar” instead of “car” is an expected pattern. However, if a child were saying “sar” instead of “car” that is more unusual, and therefore more of a cause for concern. If a child is using these more unusual errors, their speech sound development is described as being “disordered”. However, that is not to say that I would never be concerned about “tar” instead of “car”. If a 5 or 6 year old is still saying it that way, then their speech sound development would be described as “delayed”. This means that it is following the usual pattern but they are still using some sound errors expected at a younger age. I might advise therapy earlier for the child saying “s” instead of “c/k”, but I would eventually advise therapy for the child saying “t” instead of “c/k” too if it doesn’t resolve naturally. So, how do I know whether to be concerned about my child’s speech or not? Take a recording of your child talking. Keep it and date it. You can make a recording every couple of months to listen back to and this will help you to hear whether your child is making progress with clarity or not. It can be hard to tell this when you are listening to them all day every day. Alternatively, make a list of some words your child struggles to say clearly. Keep the list and check back on it in a few months – are the same words still difficult? Talk to your child’s Health Visitor, nursery or school. They see lots of children and are therefore likely to have a better idea of whether your child’s speech sounds the same as other children of their age. They probably won’t be able to pinpoint the problem, but they may be able to help shed some light on whether your child should be referred for speech and language therapy or not. Finally, speech development charts can be of some help. Although, as I have explained, it is more complicated than just looking at a chart, they can give you a useful idea of whether the sounds your child finds difficult are typically early developing sounds or later developing sounds. For example, if you are the parent of a 4-year old whose only difficulty is with “r”, this is a later developing sound and there is probably not too much cause for concern yet. It might be better to monitor for a while if you are sure that is the only difficult sound. So, after all that, here is a chart based on the work of Shriberg (1993), who found that there is some consistency to the order that children tend to develop sounds. Here the sounds are split into 3 groups – early developing, middle developing and later developing. 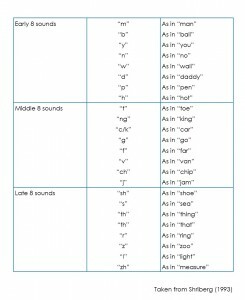 This gives some idea of the order in which children generally use sounds. 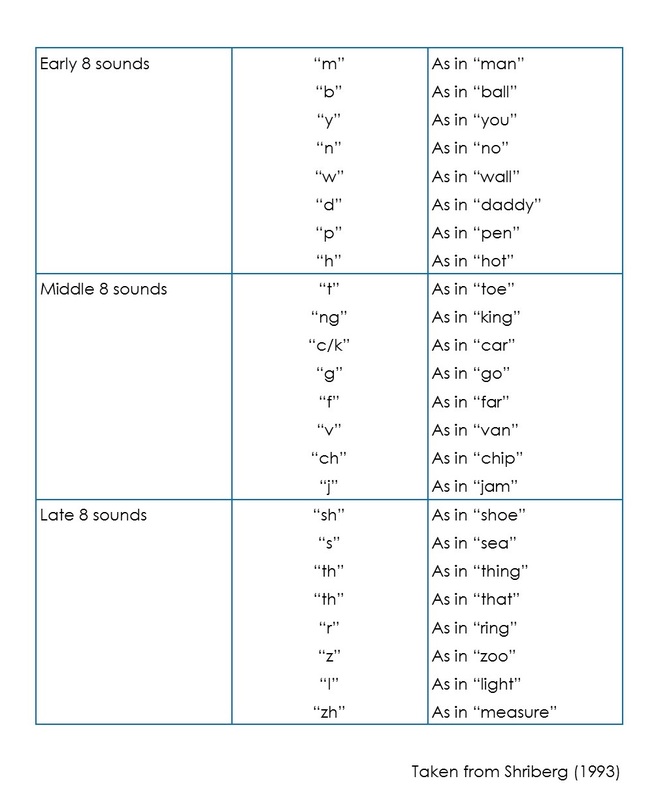 If you want to look at other speech sound charts based on different research, there are several laid out in this post about speech sound development. 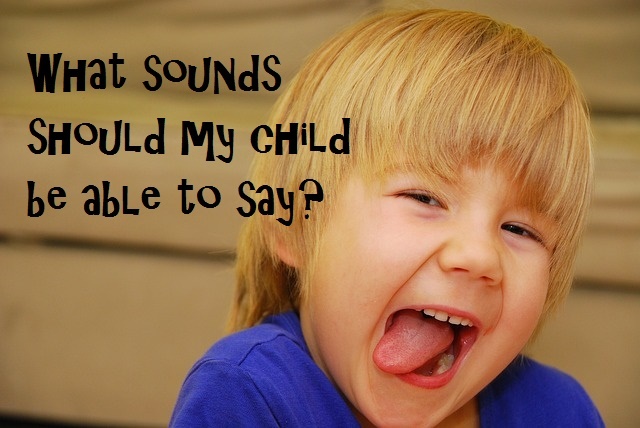 Also, take a look at this post about the process of speech sound therapy. Finally, if you want expert guidance through the process of helping children with unclear speech, come and join our online course.